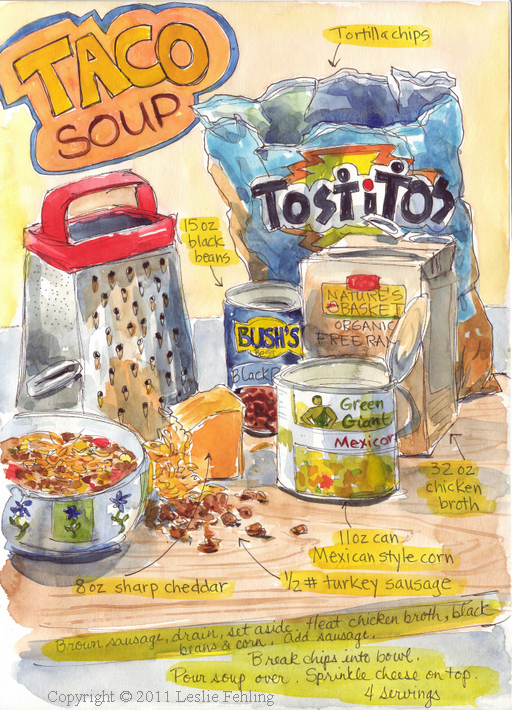 I'm almost embarrassed to call this recipe Taco Soup. It's not at all spicy, and it doesn't call for taco seasoning or salsa. But the woman who gave me the recipe years ago titled it Taco Soup, and Taco Soup it shall remain. I had a crazy day today and definitely didn't have a lot of time to prepare dinner. I had been out running errands in a snow storm that got progressively worse as the hours wore on, and by the time I headed home, I was more than a little concerned about making it up the road to the top of the ridge where we live. As expected, my van, with its "all-season" tires, started spinning and sliding as soon as I headed up the hill. But my knight in shining armor (or should I say dirty pickup truck?) came to my rescue and towed me up the hill. Thank goodness Fred was home to save me or I might still be waiting for AAA! Anyway, I needed something quick and warm and yummy for dinner, so I pulled out this old standby recipe. It's ready in about 10-15 minutes, just the amount of time it takes to brown the sausage. Serve it up with a salad and you've got a great meal. This sketch came about because, well, I just felt like having some fun. I've had a week full of running around to appointments, rushing from one thing to another, trying to get more done every day than is humanly possible. And as I was making dinner tonight I just thought, "I haven't had any fun lately!" and figured it wouldn't kill me to just stop (after dinner), get out my sketchbook, and escape for a little while. I scribbled the lines in quickly and tried not to fuss over it. I played! On my agenda for tomorrow ... order a set of chunky, hunky, really macho snow tires for my van. I don't think winter is going away anytime soon. Brown sausage, drain, and set aside. Heat chicken broth, black beans, and corn together. Add sausage and heat through. Add salt to taste. Break tortilla chips into each bowl. Ladle soup over. - If your chicken broth contains salt, you may not need any additional salt in the soup. - This simple soup is great as is, but you can also jazz it up in any number of ways. Add a can of stewed tomatoes, or some salsa. For extra kick, add canned green chiles or jalapenos. - Don't skip the tortillas in each bowl. They give the soup a lot of flavor and thicken it somewhat. - Pork sausage may be used in place of the turkey sausage. I like to use sweet Italian sausage. A Little One is on the Way! My daughter is expecting a baby this spring, my first grandchild! I'm so excited I can hardly stand it! Every time I think about holding that little bundle on my shoulder and feeling that soft, heavy weight as he falls asleep, I just get all choked up, remembering the days of holding my own babies. There's not much in this world that makes me happier than rocking a contented, sleeping baby. So, I'm hosting a baby shower for Sara here at our house in a few weeks. I looked online for invitations and got some good ideas, but didn't see anything that seemed just right, so I made my own. I loved a design that I saw at tinyprints, but it wasn't exactly what I wanted, so I painted my own version of it. 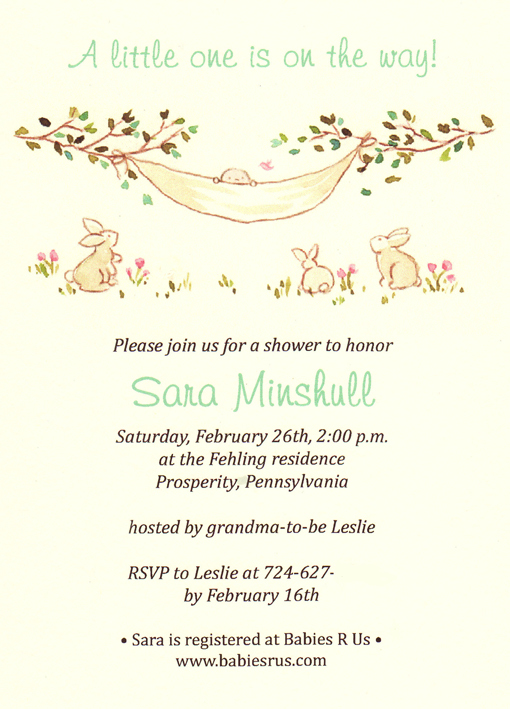 I ordered 5" x 7" ivory card stock and aqua envelopes from Paper Source, then printed the invitations at home. 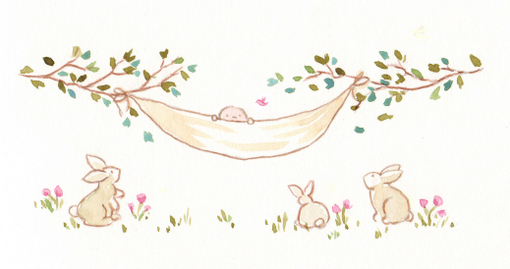 I also included another sheet with directions and a little bunny at the bottom saying "It's a BOY!" Now, to plan the rest of the shower - the decorations, food, games, and favors. I have lots of ideas. It will be fun and happy and pretty, with lots of and giggles and laughter - just like the baby that's coming in April! I pass this farm on my way to church every week and always like the way the barn looks, silhouetted against the background of trees. When I painted this little sketch last weekend, it was a bright sunny day and the pine trees had a few touches of snow still clinging to the branches. 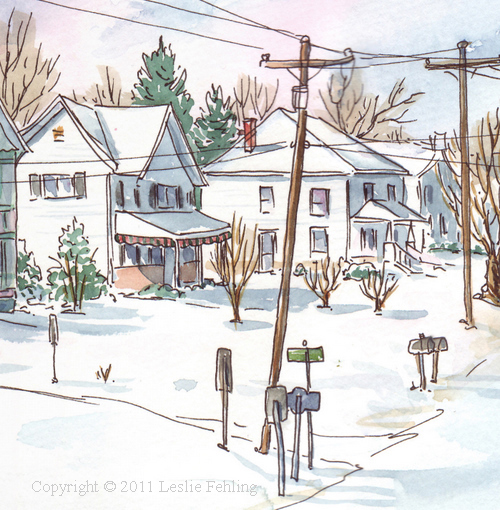 Near Lippencott, PA 3 1/2" x 9"
If you're a regular follower of my blog, be forewarned! You might get tired of looking at scenes of picturesque barns and farms over the coming months. I just love the looks of them - I can't help it! The way the light and shadows play off the angles on the farm buildings, the contrast between the man made structures and the natural environment around them, the rolling terrain of the hills with the dividing lines of trees and fences - I can't get enough of them. 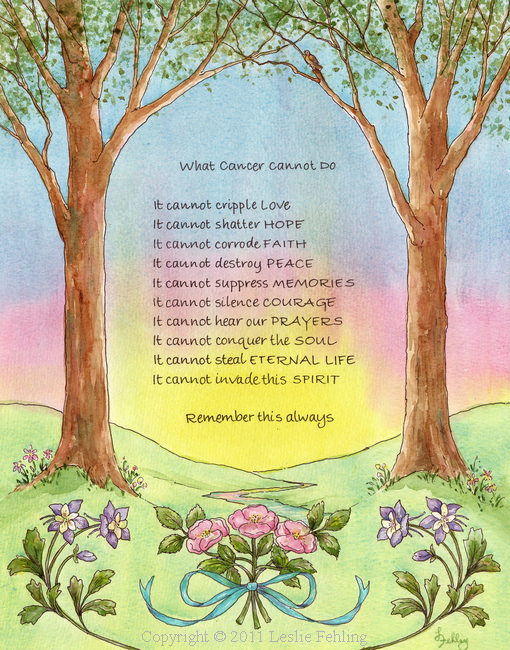 We have all been touched by cancer in some way and I think most of us have experienced that feeling of helplessness that comes with seeing a friend or loved one deal with something that seems beyond their (and our) control. We look for some way to help or encourage - to lighten their burden or brighten their day. 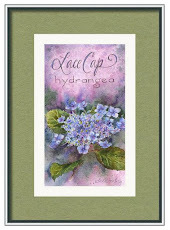 I hope this artwork does just that for one courageous woman who is fighting ovarian cancer. 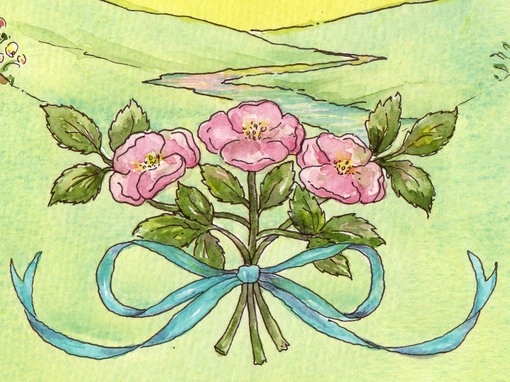 Her friend asked me to do a painting to illustrate the poem "What Cancer Cannot Do". After hearing about this very special woman who has impacted so many lives, I came up with a design that I hope symbolizes her life, her faith, and the love and support she has from her community of friends and family. The sky is a rainbow of colors, bringing to mind God’s covenant with man, as recounted in the book of Genesis. It is a perfect reminder of our Lord’s protection and the keeping of His promises to us. The sun shines in the center of the painting, signifying constancy, hope, and the dawning of each new day. The river is a symbol of life’s journey, with its twists and turns, always flowing toward something greater than one’s self. It reflects the many colors of the sky above, just as our lives reflect God’s love and faithfulness to us. The trees represent strength and the ability to withstand the winds of adversity. As the trees are rooted in the earth, so we are rooted in God. Our faith is the firm foundation upon which we stand and grow. The intertwining branches of the trees represent our relationships with friends and family. We grow together and touch each other's lives, connected to one another not only during the happy sunshine days of summer, but also during the dark winter nights of the soul. The nightingale sings its most joyful song as dawn approaches, making it a symbol of the holy joy of the righteous Christian soul, singing in the darkness of this world. It is a joyful song, anticipating the arrival of Christ and His light. Pink roses represent happiness, and roses in general have for centuries stood for love and remembrance. These roses are the wild, uncultivated type that bloom in a boisterous display every summer. 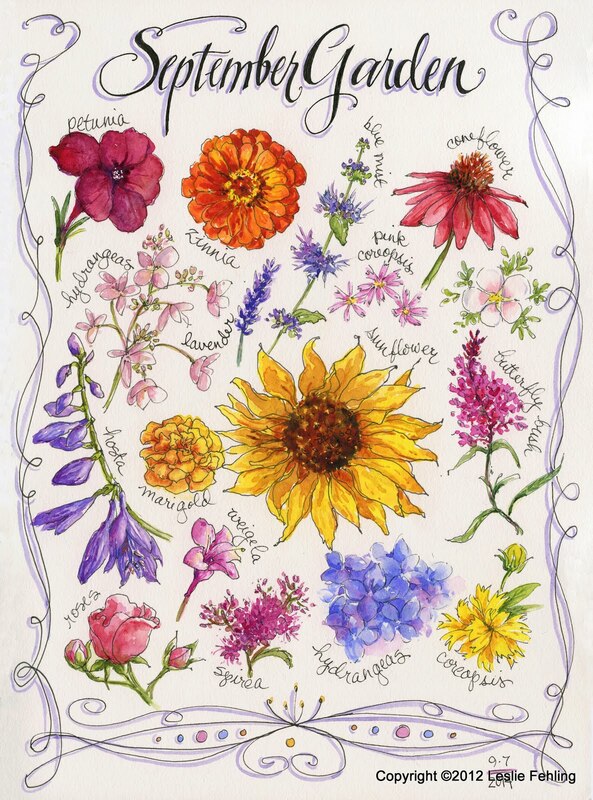 They are sturdy, fragrant, and beautiful, with no need for coddling. They stand strong and flourish despite challenging conditions. The teal ribbon stands for ovarian cancer awareness. 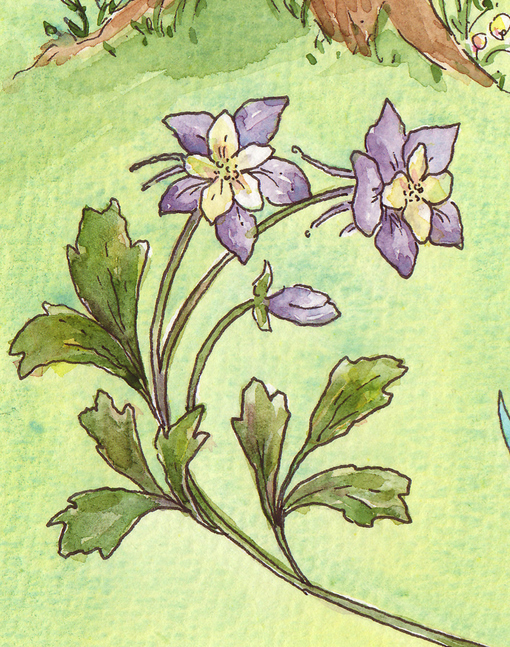 And, finally, the columbine flowers are a traditional symbol of holiness, fidelity, and the Holy Spirit. As I worked on this painting, I thought often about this woman whom I will never meet. I hope she's blessed by my efforts. I approached this painting with a bit of trepidation. 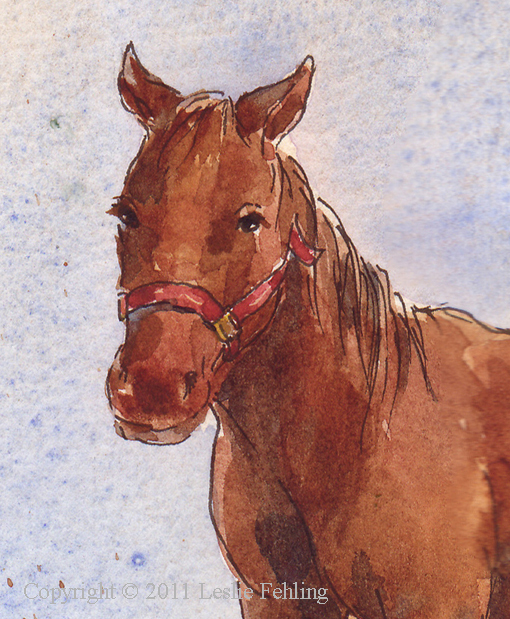 It's the first time I've tried to draw or paint horses. But they looked so appealing with their thick winter coats and big luminous eyes, I just couldn't resist giving it a try. Snow flurries filled the air, but it didn't bother them a bit. 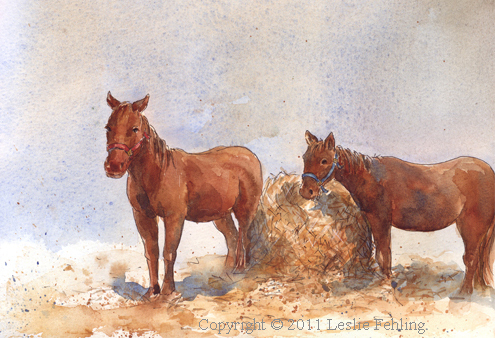 They were perfectly content standing in the field, munching on their hay. I got out of the van to take a picture, and the one on the left came over to see if I had a treat for him. I haven't petted a horse in years, but as soon as I stretched out my hand and felt that plush fur and smelled that horse-y smell, it took me back to the years of my kids raising miniature horses, and of that cranky Shetland pony, Misty, that we had to get after Sara read Misty of Chincoteague. See, that's one of the disadvantages of living in the country - you don't really have a good excuse for telling your kids no when they beg for a pony! 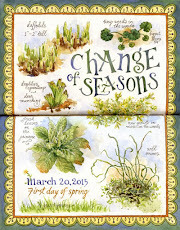 Next time I go out sketching, I'll be sure to take some carrots along. There's something so comforting about stroking the soft muzzle of a horse - I don't think it'll be too long before I do it again. It was one of those days yesterday where it was blindingly bright and sunny one minute, then the next time I looked out the window, it was blizzarding. I took a drive through the country when I was out doing errands and stopped to sketch a pretty Victorian house that I've always admired in Jefferson, PA. With temps in the 20s, I didn't last long sitting in my van on the side of the road, so I finished the sketch last evening at home. My perspective is a little off, but, hey, it isn't easy drawing with my sketchbook propped at an awkward angle on the steering wheel! Despite its imperfections, I like this little painting - the sunshine and shadows, the whacky angle of the telephone lines, and the watery washes on the sky. 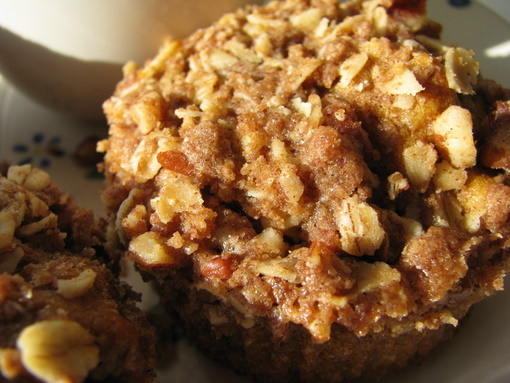 I baked up a batch of these muffins this morning, and they tasted so good that I just had to share the recipe with all of you. 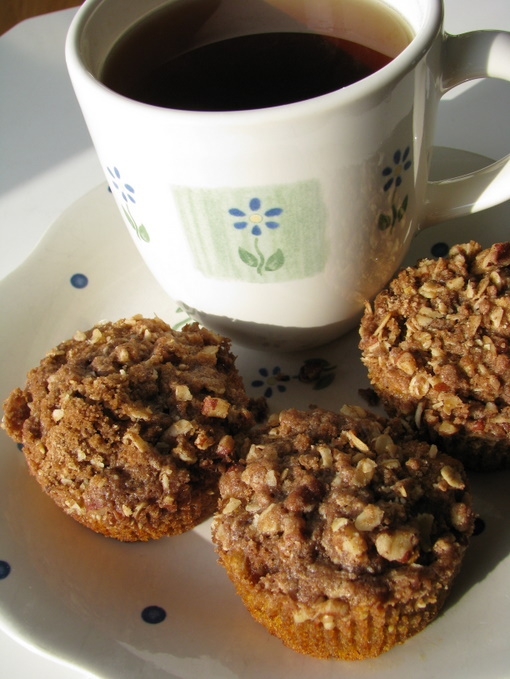 They're just the thing for a snowy winter morning or with a cup of tea in the afternoon when you need a break. I've been making this recipe for probably 25 years, ever since it was passed along to me by a friend. Isn't that how we get most of our best recipes? From a friend who got it from a friend who got it from another friend. So, here's one I'm passing along to you. Trust me - it's a keeper! Heat oven to 400º. Line 18 muffin cups with paper cupcake liners. Combine dry ingredients. Add pumpkin, brown sugar, oil, milk, egg, and vanilla. Stir just until moistened. 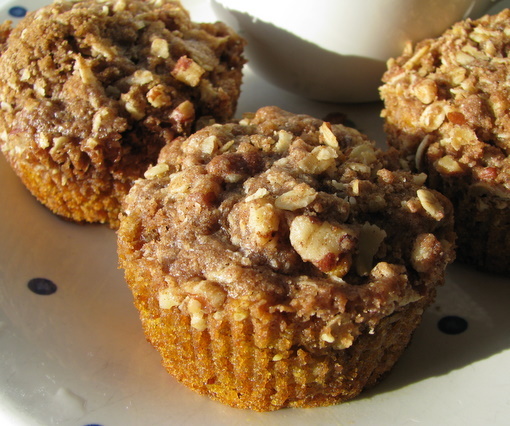 Fill muffin cups ¾ full with batter. Combine remaining ingredients. Mix until crumbly. Sprinkle evenly over muffins. Bake 15-20 minutes or until wooden pick comes out clean. I'm off to a fresh start for the new year! 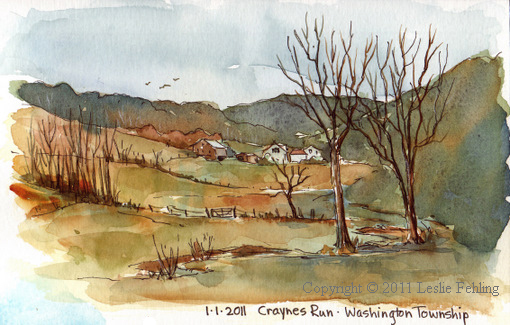 I'm going to focus my creative efforts this year on completing lots and lots of sketches of Greene County, PA, where I live. My ultimate goal is to one day publish a book of my sketches. Wow! That's a big goal and something that will take considerable time and effort, but I'm taking the first small step toward it by starting with PAGE 1 of my new sketchbook. 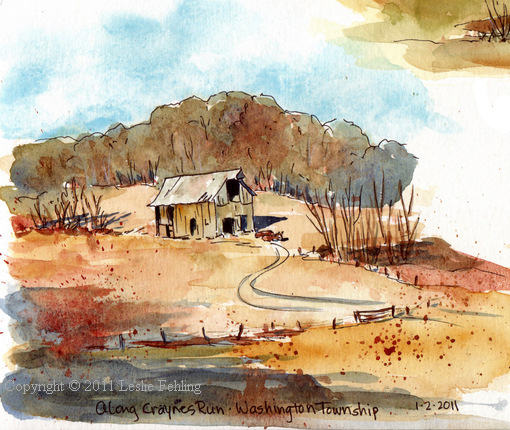 I live in a beautiful rural area of southwestern Pennsylvania, and idyllic scenes worthy of brush or pen lie waiting around every bend in the road. I didn't travel far to find these two views - they're just down the road from my home. It was an overcast day when I headed out to paint on January 1st, but New Year's Eve rains had brought the valley to life, and I could see a cast of green over all the fields, a welcome sight in the dead of winter. The next day was clear and sunny, with a bright blue sky and puffy white clouds. What a relief after the weeks of grey, snowy days we had experienced in December! 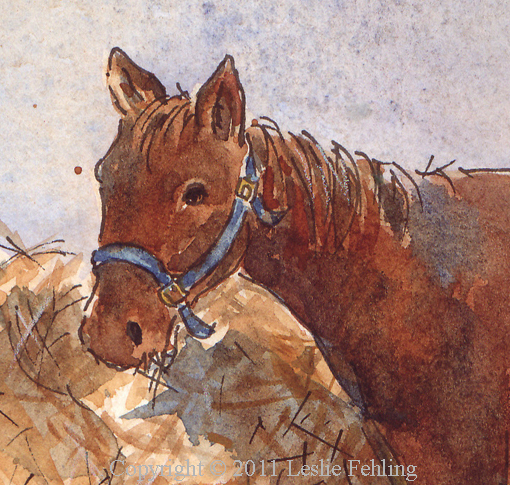 I enjoyed watching the two horses sunning themselves and napping in the sunshine in front of the barn. This is a scene I've been itching to paint for years, every time I drive by it - and I finally did! 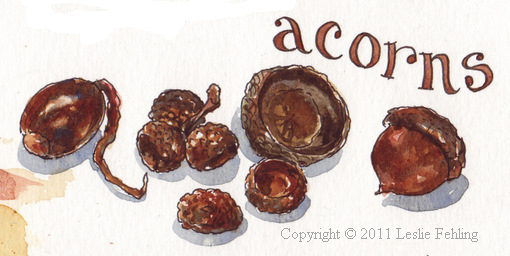 That evening, I took Buckley for a walk in our woods and picked up these acorns along the way. 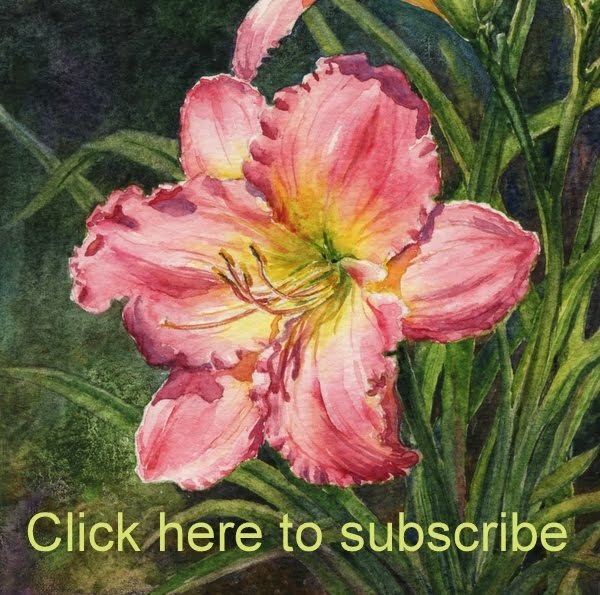 It's nice to have something to paint back in the studio where I can stay nice and warm, instead of being parked in a chilly van on the roadside. So, wish me luck on my journey! 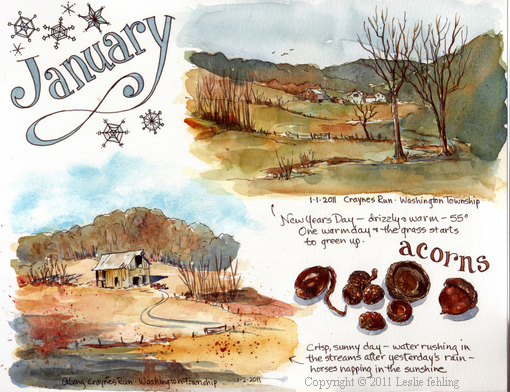 I'll be sharing plenty of sketches this year of our little corner of the world. 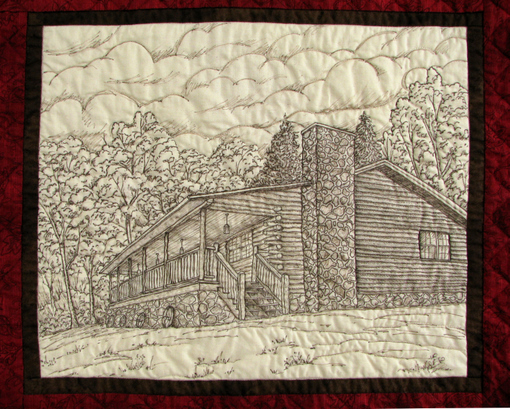 When I was asked to make a quilted wallhanging with my client's log home on it, I presented them with several sketches of possible designs. Most of them had a combination of patchwork and applique - very traditional - but I also had an idea that was a little bit different. I like to quilt and I like to sketch, so why not combine the two into one unique work of art? 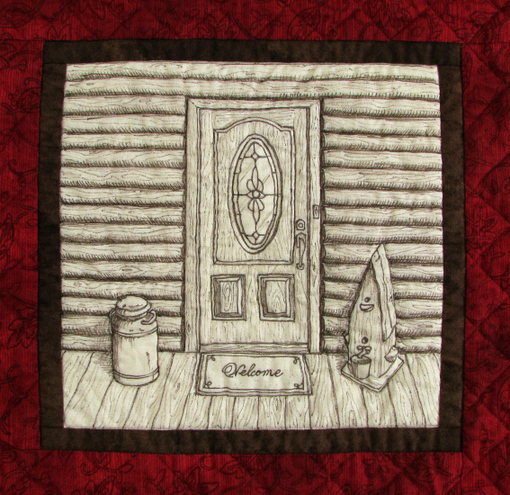 My clients loved the idea and waited patiently for me to finish the quilt - just in time for Christmas! 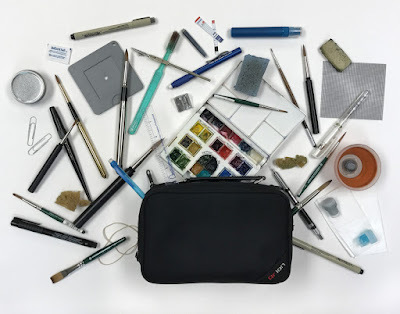 The drawings are all original artwork, drawn directly onto cotton fabric with a dark brown Pigma Micron pen which contains waterproof, fade proof archival ink. To make my job a little easier, I ironed Reynolds freezer paper to the wrong side of the tan fabric. This stiffened the fabric to make it more manageable, and was easily removed by simply peeling it off after finishing the drawings. This is the full front view of the home, which sits on a hillside overlooking the woodlands and farms of Greene County, Pennsylvania. Drawing all of those logs and stones was a wee bit time-consuming! 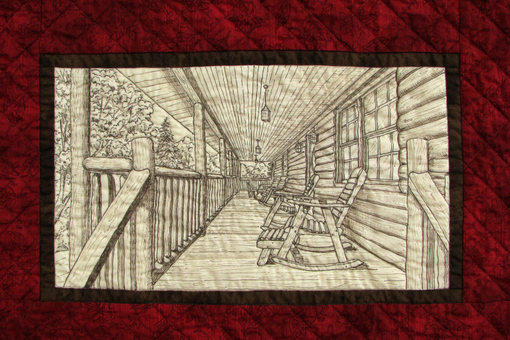 Below is the front porch, with its rockers and picnic table. And, of course logs, logs, and more logs! The quilt has a batting that is 80% cotton and 20% polyester. 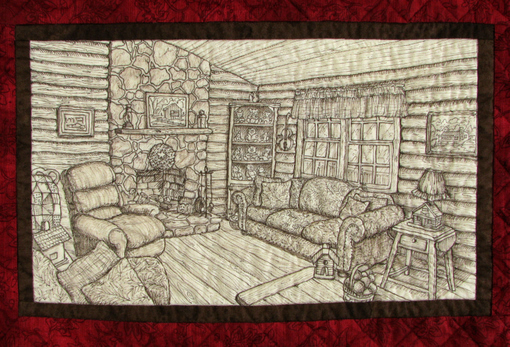 I kept the quilting to a minimum on the drawings, because I wanted to have a consistent amount of quilting across the entire quilt - it helps it to hang flat, without bulges and waviness. Next, through the front door and into the cozy living room, with its overstuffed furniture, stone fireplace, log walls, hardwood floor, and wood ceiling. I got really good at drawing wood grain by the time this block was finished! 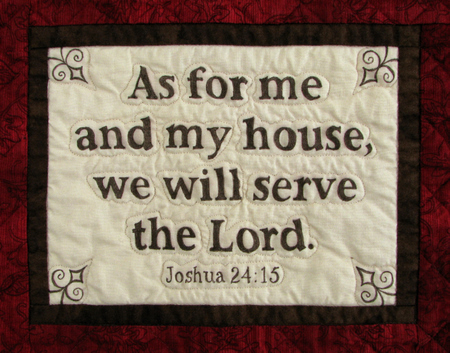 A favorite Bible verse was incorporated into the block below. The lettering was hand drawn. 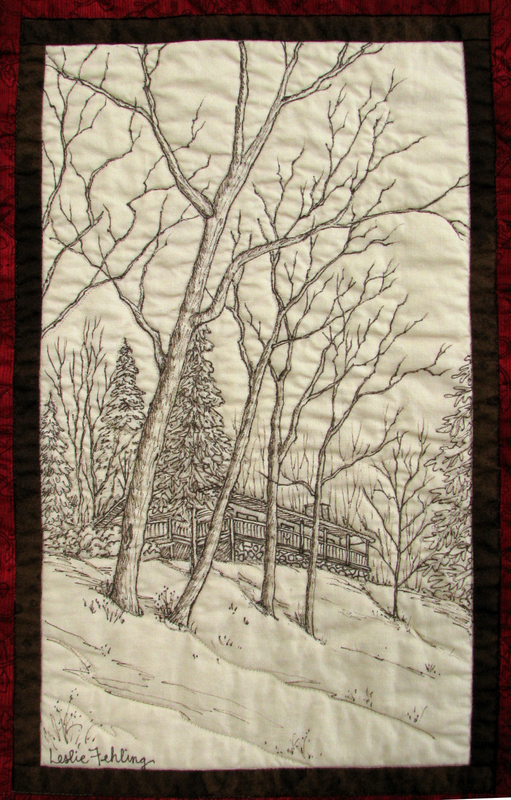 It looked a lot neater before I quilted the wallhanging and gently rinsed it. I guess the crinkled and puckery look is all part of charm of a quilt. It's fabric, not paper, after all. 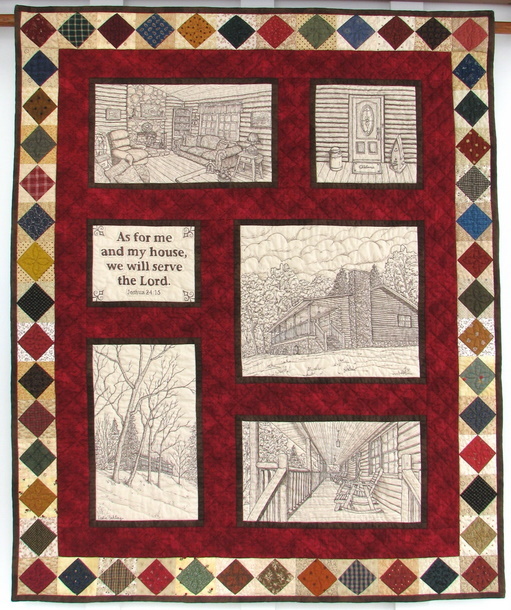 After completing all the drawings, I stitched them together with a dark brown frame around each block and red sashing between them. I then raided my stash to find a colorful mix of fabrics for the "square-within-a-square" pieced border. I couldn't wait to show my clients the finished product. They absolutely love it!